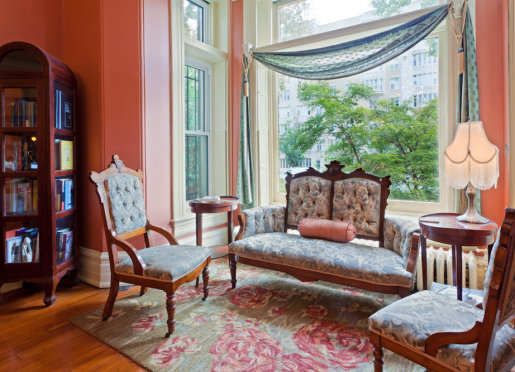 The Akwaaba Bed and Breakfast is more than just a place to stay in D.C. It is a place to relax among the bustling city life. 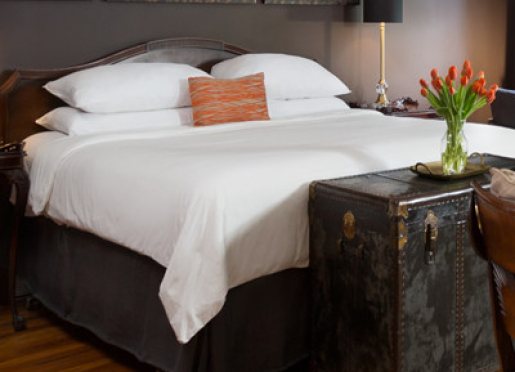 Our historic townhouse inn is conveniently located in the trendy DuPont Circle Neighborhood, just 4 blocks from Metro station. We’re just a short subway ride away from many of D.C.’s most loved tourist attractions including the Smithsonian Museums, National Mall, White House, National Monuments, National Zoo and the Spy Museum. We’re within walking distance to countless bars, boutiques and restaurants. This African American owned and operated inn offers eight guest rooms, each that are tastefully furnished with a private bath and High Speed Wireless Internet access. Air conditioning, cable TV and a small refrigerator are also found in each room.Select rooms have Jacuzzi tubs and couples showers. Decorated to celebrate literacy, each room features a book collection of the author or genre it was named after. You can choose from the writings of Zora Neale Hurston, Langston Hughes, Toni Morrison or Walter Mosley just to name a few. 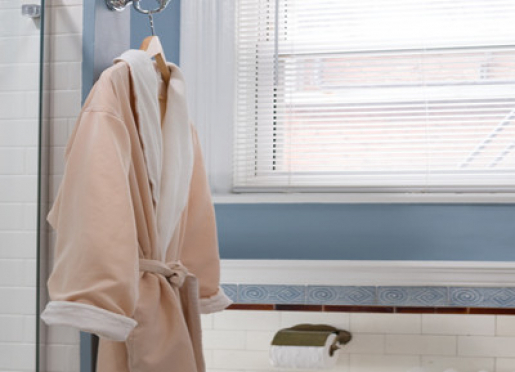 Or, cozy up to the Romance, Inspiration or Modern Classics room. Don’t feel like going out, the inn also features an architecturally stunning parlor with a fireplace and dining room where you can gather with friends. 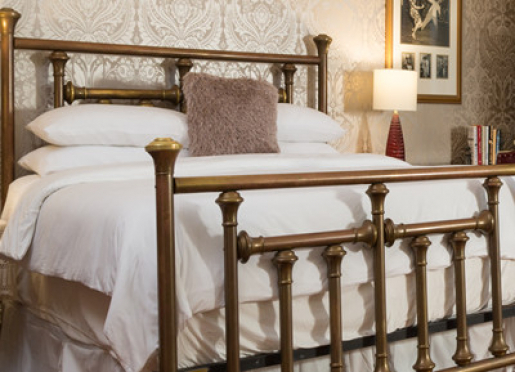 In the heart of the nation's capital stands Akwaaba D.C., a historic townhouse in fashionable Dupont Circle. You can walk to The White House and visit all the patriotic wonders of the city, or head over to Howard University and save time to stop by the national headquarters of The Links, Jack and Jill, Delta Sigma Theta and many other organizations, all a casual stroll from Akwaaba D.C. On second thought, you may be tempted to never leave the inn. This architectural jewel features a welcoming parlor with fireplace, a grand dining room where an expansive breakfast is served, and elegantly appointed guest rooms with all the amenities. And did we mention the books! 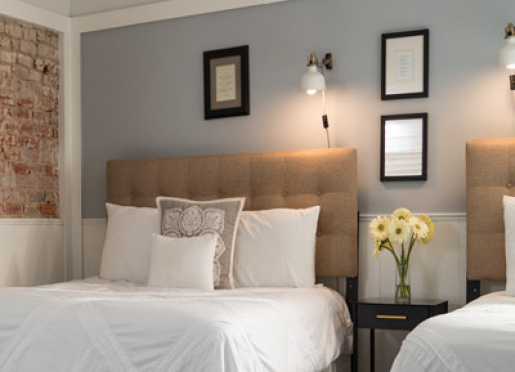 Designed with a literary theme in mind, each guest room features the books of the author or genre it is named after. 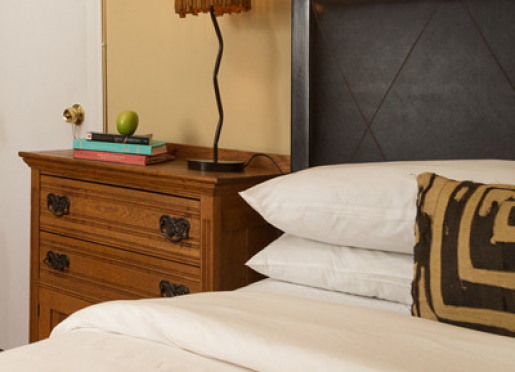 Choose from the Zora Neale Hurston, Langston Hughes, Toni Morrison or Walter Mosley or Romance guest rooms. 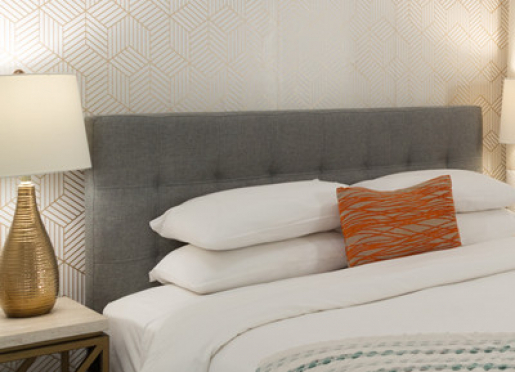 Whichever your preference, luxury and literature await you at Akwaaba D.C.
Dupont Circle, offers visitors more than 80 restaurant choices, exquisite, boutique shopping, several excellent bookstores, movie theaters, hip night-clubs and the Improv comedy theater. 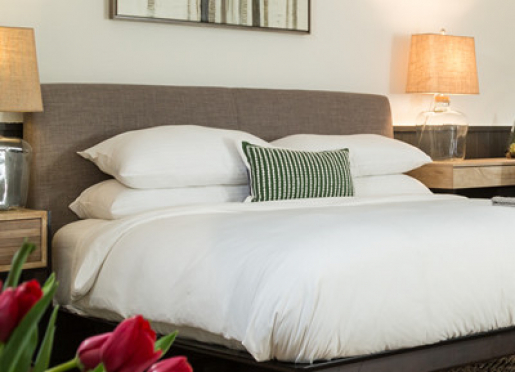 From a romantic weekend, sightseeing tour of the Smithsonian's, or the professional business trip, Akwaaba Bed and Breakfast DC can make your stay comfortable, convenient and memorable. From Breakfast To Champagne. Pleasant Dreams! All guests at Akwaaba are treated to a hot cooked breakfast each morning, served 8:00 a.m. weekdays and 9:00 a.m. weekends and holidays. Travelers needing to exit the home earlier may request a “Breakfast-to-Go” package with fresh fruit, pastry and a piping hot cup of coffee—just grab and go. All guest rooms include wireless Internet and cable TV and a small refrigerator. Most guests we host are vacation travelers, however there's also a significant number of business travelers as well. We are unique because we are African American, Woman owned. We offer personal service at a great value. Travelers who have never been to Washington D.C. should be sure to check out the Smithsonian Museums, the city's numerous historical monuments, and its bustling city life. The best compliment we can receive is when a guest says that we offer the perfect place to relax and rejuvenate. Our best kept secret is how much there really is to do here, and how small a big city like Washington can feel. There are more than 80 restaurants within a 15 minute walk, as well as museums, the White House, and great shopping. Washington has more restaurants per capita than any other city in the US. There are too many restaurants to name offer all types of food and price ranges. >From our location, visitors can easily access the best sightseeing Washington has to offer. 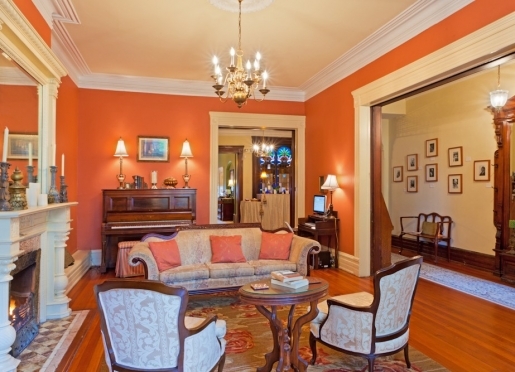 The home is 4 blocks, less than a 10-minute walk, to the Dupont Circle Metro station. From here, the subway will take you to the Smithsonian Museums, National Mall, White House, National Monuments or the National Zoo. Business travelers will find easy access to the new Washington Convention Center, MCI Center, Reagan Convention Center as well as the Hilton Towers and Marriott Wardman conference hotels. Visitors to Washington DC can enjoy the many free sights, including the Smithsonian Museums, and National Monuments, most of which are located on the National Mall. In addition, travelers will find many private Art Galleries, Historic homes and private Museums located throughout Washington DC neighborhoods. The National Mall an almost 3 mile east/west stretch of green space in downtown Washington DC is the center of most of the sightseeing. 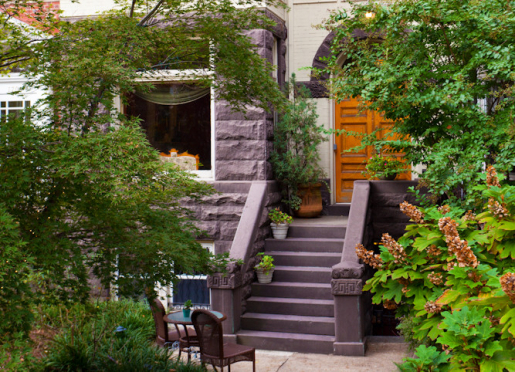 Conveniently located just east of Dupont Circle, one of Washington's most prized neighborhoods. 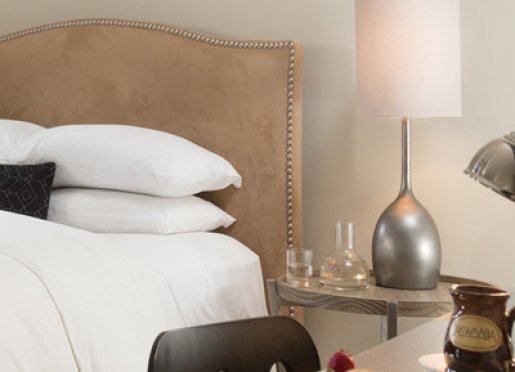 Guests will find easy access to the National Mall, Smithsonian Museums and Monuments. The city's Metro system is a short 10-minute walk, and additionally a major bus line passes directly in front of the home, taking you to the White House in less than 10 minutes. The business traveler will find easy access to Washington's new Convention Center, MCI center, and conference hotels- the Hilton Towers, Marriott Wardman Park and Omni Shoreham. All are a short metro ride, or even walking distance as in the Hilton Towers. Evenings, Dupont circle offers a wide variety of more than 80 restaurants from the simple bistro to fine dining. Nearby Connecticut Avenue, is home to one of Washington's best collection of shops, bookstores, movie theaters, the Improv Theatre, and many nightclubs. "Washingtonís Castro"is just one block from the home on 17th Street. Massage packages can be arranged with a local spa that will come to the house. Please inquire when making your reservation—advanced planning is necessary in most cases. 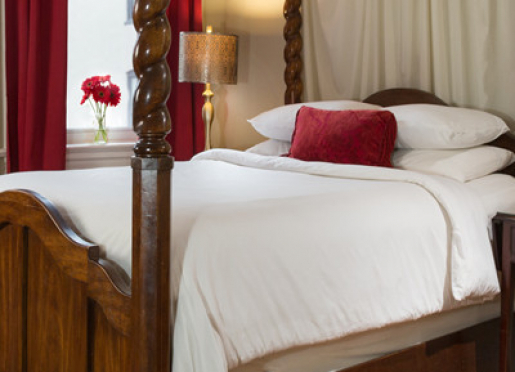 We also offer our Whipped Cream and Pleasant Dreams Romance Package, a bottle of Champagne or Sparkling Cider, homemade Whipped Cream, fresh Strawberries, and a room filled with lit candles, perfect for those who plan a romantic getaway to Washington.